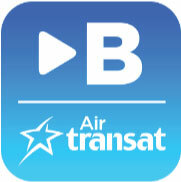 CinePlus B for Air Transat Bowing 737 Aircraft is now available for Adroid Devices as well as Apple devices. 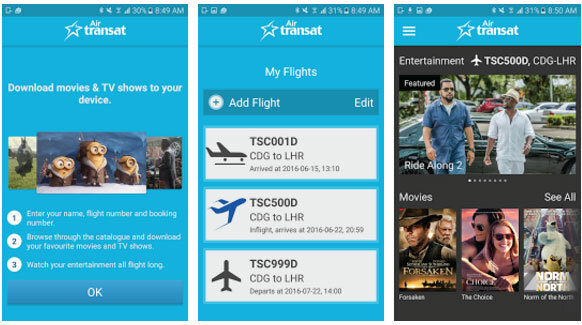 Air Transat is pleased to announce the release of the Android version of its CinePlus B app, designed specifically for use on its Boeing 737 aircraft. Available free of charge on the App Store and now the Google Play Store, this new app lets passengers access a selection of Air Transat’s inflight entertainment content and download up to three choices per flight segment. Passengers flying Air Transat this summer will be treated to an unparalleled flight experience loaded with personalized entertainment options. Air Transat’s CinePlus B app keeps the airline's Boeing 737 passengers entertained with a selection of movies and TV programs that can be viewed during their flight! This app works exclusively on Boeing 737 aircraft and features updated entertainment content every two months. Available in the App Store, and now available in the Google Play Store. Note: There is no WiFi access or charging station on Air Transat's Boeing 737 aircraft. They recommend charging mobile devices prior to boarding.